Tri-County Agency of Brick would like to say Thank you for voting for us. We are proud to be selected by the readers of the Asbury Park Press as Best of the Best for Ocean County! As our loyal customers know, we are committed to each and every one and strive to be the most friendly and knowledgeable staff possible. It is our 8th time winning the Best of the APP and we couldn't have done it without our wonderful customers! We appreciate your loyalty and will continue to provide you with the very best service! 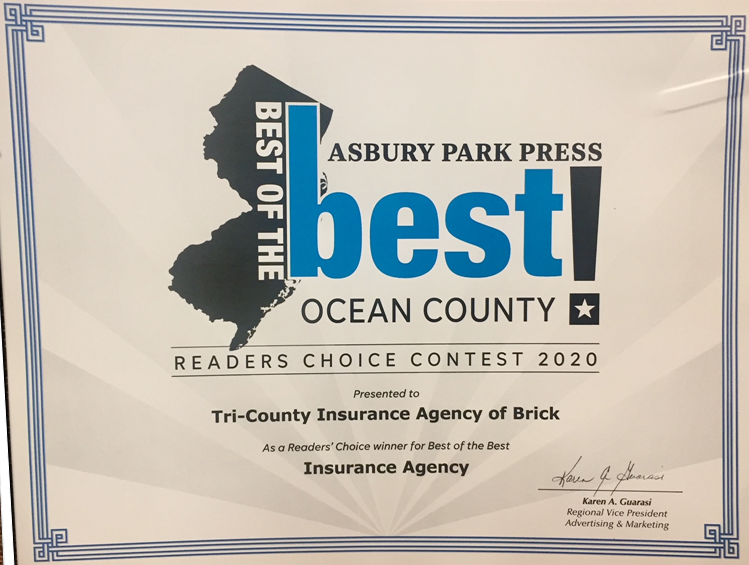 Tri County Agency of Brick, Inc., a family owned and operated agency, is committed to protecting New Jersey families through the best and worst of times including, but not limited to, natural disasters, economic recessions and day-to-day needs. It is nice to know that in a world of constant change some things remain constant, like the personal service our agency brings to our clients. We are also a Pennsylvania, Maine, and Georgia licensed insurance agency. As a Trusted Choice® insurance agency we are dedicated to you and are committed to treating you as a person, not a policy. We provide our clients with excellent service including multiple coverage options to suit you or your business, assistance in the claims handling process, and 24/7 emergency service. You will also be assured that your inquiries will be handled in a professional, timely manner. These are our constant commitments to serving you. Our website was recently redesigned to help serve you better, enable you to learn more about our practices, our companies and our insurance products. If you have any questions or would like to set up an appointment with a Tri County insurance agent, call at 732-477-1010, email info@tri-countyinsurance.com, or contact us through our website by clicking here. Tri County Agency of Brick, Inc.